The public utility of Munich in Germany, Stadtwerke München GmbH (SWM), is planning to generate sufficient green energy at its plants to cover all energy consumption in Munich by 2025. SWM has already succeeded in generating enough renewable energy to supply all households in the metropolis. As part of this endeavour, SWM has invested in several onshore and offshore wind farms in recent years, and now SWM has teamed up with Norwegian utilities Eidsiva Energi and Gudbrandsdal Energi to establish an onshore wind farm, namely ‘Raskiftet Wind Farm’. The farm will be located in the municipalities of Åmot and Trysil, some 200 km northeast of Oslo and its 350 GWh of generated renewable energy will contribute further to the greening of Munich. For this purpose, SWM decided to obtain a 60% share in the Special Purpose Vehicle (SPV) Austri Raskiftet DA and commissioned BBB/Ramboll to provide a full-scope assessment of the project documentation (technical due diligence). In the course of the due diligence process all relevant project contracts, civil and electrical designs and the technical aspects of the permits were assessed. Furthermore the concepts for logistics, construction and operation as well as the project-related CAPEX and OPEX assumptions were reviewed. In order to reliably evaluate future energy yields, BBB/Ramboll prepared a Wind resource assessment (according to DIN EN ISO/IEC 17025:2005). Exposed to severe environmental and climate conditions, Raskiftet wind energy project posed major challenges to BBB/Ramboll’s wind consultants. For the evaluation of energy yields, data deriving from met mast and several short-term LiDAR measurements had to be processed. As the project site is large, the terrain is highly complex and the number of turbines to be installed is big, great experience on the wind consultant’s side was needed. Especially because the measurement sensors were continuously affected by cold climate and freezing, BBB/Ramboll had to analyse data very carefully in order to avoid distorting effects and imprecise results. The assessment included a thorough data analysis of eight different wind measurements, i.e. one met mast measurement that was measuring permanently during the whole campaign and seven LiDAR wind measurements that were distributed throughout the whole wind farm area, measuring for shorter time periods parallel to the permanent measurement. Based on the resulting data a 3-dimensional CFD-model describing the wind flow situation was created and verified. For the subsequent interpretation of the model and the elaboration of a realistic scenario of the specific site, the expert’s year-long experience was indispensable. After the transaction was successfully completed, BBB/Ramboll has been commissioned by the SPV with the supervision of the realisation process as the Owner's Engineer. 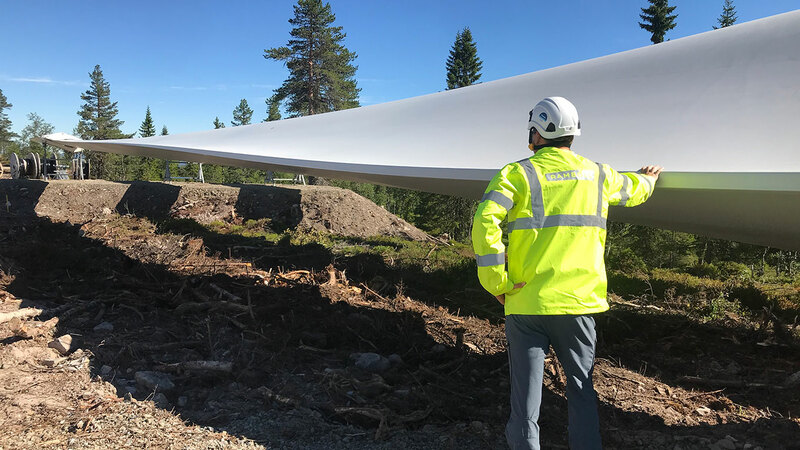 In collaboration with onshore wind experts from Ramboll's Energy unit in Norway, BBB/Ramboll will help establish the 31 3.6MW wind turbines that will make up Raskiftet Wind Farm. 'The majority shareholder of the SPV, SWM, has been one of our most valued clients for close to 10 years', says Joachim Binotsch, part of BBB's management group. 'BBB's international expertise combined with Ramboll's local onshore wind expertise from Norway was the primary reason why we were selected for the job', he adds. BBB and Ramboll will provide more than 900 man-days on the project, until commissioning of the wind farm at the end of 2018. As the Owner's Engineer, BBB and Ramboll will be responsible for supervision of the wind turbine works as well as a 32kV/132kV internal substation, a 16.8km 132kV overhead line, foundations/roads, platforms/cabling, and a 132kV switchyard at the grid connection point.